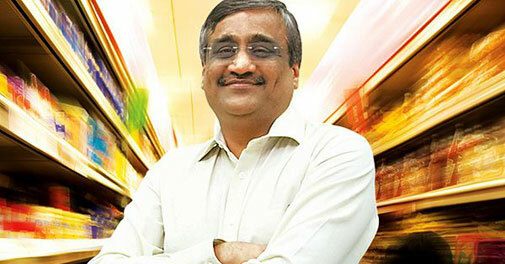 For the last two years, Kishore Biyani has been crying himself hoarse saying the e-commerce opportunity in India was vastly overstated. And when he’s finally being proven right, he isn’t about to let up. His predictions might seem dire, but he’s been right thus far. Biyani had been famously dismissive of e-commerce startups over the last few years, saying that none of the online grocers would survive, and that 90% of all startups were “nonsense.” And e-commerce startups have done little to prove him wrong. Most are languishing with losses that have had to be funded by deep-pocketed venture capital firms — Flipkart lost 5,223 crore in 2016, and Amazon lost Rs 3,571 crore. Snapdeal lost nearly Rs. 3000 crore, fired 500 employees, and is now faced with the prospect of seeing its valuation fall 94% from its peak. And it’s not just startups — even established e-commerce firms haven’t fared much better. Infibeam had gone public last year, and managed to eke out a tiny Rs. 12 crore profit in the last quarter of 2017. But it was thanks mainly to its BuildaBazaar platform which provides cloud-based services for merchants — its e-commerce arm ended up losing Rs. 2.64 crore. This effect plays out globally too. 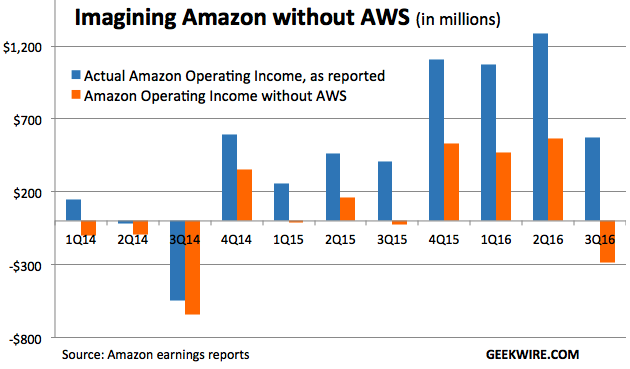 Without Amazon Web Services, Amazon would’ve made a loss of $286 million in the quarter ending 31st October in 2016; thanks to its $861 million in operating income from its cloud services, it managed to post an operating income of $575 million. Most Indian e-commerce startups, on the other hand, are unidimensional. None of them runs a side business that brings in profits as they try to grab e-commerce marketshare through discounts and offers. Even Future Group, India’s leading offline retailer, has found it hard to move into the online space. It’s sunk Rs. 250 crore into FutureBazaar.com which it had founded a decade ago, and it’s shut down Fab Furnish soon after acquiring it. And Biyani seems to have no immediate plans to get back into the e-commerce game which he seems to think of as a money pit. “Having burnt our fingers, we have decided to take a break of at least two years before even thinking anything remotely about online,” he’s declared. This wouldn’t be good news like Snapdeal, which is trying to negotiate a sale to Flipkart, and Flipkart itself, which is trying to take on Amazon. Indian startups had laughed off Biyani’s ominous predictions during the heady days of 2014-2015, when money was abundant and investors were bullish. The sobering realizations of the last year might’ve shown that India’s grand old man of retail might have been right after all — and e-commerce might not be the opportunity that it was made out to be.